It’s the time of year to take your family out and see the sights of Christmas Portland has to offer. Whether you’re going to hit traditional Peacock Lane, drive around Portland International Raceway (PIR) or stroll down a Fantasy Trail, these great light displays are sure to add a family tradition to your Christmas season. Now in its 23rd year, the Sunshine Division Winter Wonderland is celebrated as the largest holiday light show west of the Mississippi River! With more than 250 illuminated set pieces and animated scenes, this annual drive-through event at the Portland International Raceway has become a favorite for families who want to enjoy the season from the warmth and comfort of their cars. But car-free Portlanders need not miss out! Check the calendar for details regarding the “Lights and Leashes” Dog Walk Night on Dec. 2 and the “Bike the Lights” Night on Dec. 8. When: Nov. 26-Dec. 27 (closed Dec. 1 & 7), Sun-Thurs. 5-9 p.m. Fri. & Sat. 5-11 p.m.
Where: 1940 N Victory Blvd. Little animal lovers will be thrilled by a visit to ZooLights, the annual holiday event that decorates the Oregon Zoo with a staggering 1.5 million lights. Looking to avoid parking fees? Consider taking the MAX for an easy and budget-friendly family outing. When: Nov. 27-Jan. 3, 5-9 p.m.
An Oregon City landmark for more than 23 years, the Christmas Fantasy Trail at the Wenzel family farm treats visitors to a 1,000-foot wooded walkway decorated with thousands of lights. Not only is there an enchanted castle full of Christmas scenes, children can also stroll through a tunnel, a crooked home, a maze, and a suspension bridge, all while enjoying nightly refreshments and bonfires. When: Dec. 2-30 (closed Dec. 24 & 25), 6-9 p.m. Billed as the largest Christmas choral festival in the world, the Christmas Festival of Lights at the Grotto will feature nearly 160 concerts by school, church and civic choirs. Begin your visit in the chapel, where five concerts are scheduled each evening. Then head outside to enjoy light displays, caroling performances, puppet shows, and a petting zoo. Don’t forget to bring a donation of canned or dried food to benefit SnowCap. When: Nov. 27-Dec. 30 (closed Dec. 25), 5-9:30 p.m.
Where: 8840 NE Skidmore St.
With a traditional German Christmas market, a forest decorated with more than 400,000 lights, holiday music, fire pits, pony rides, live reindeer, and visits from Santa Claus, it’s no wonder that Christmas in the Garden at the Oregon Garden in Silverton is a beloved winter tradition. But in case you needed one more reason to make the 41-mile drive from downtown Portland, this year’s event is adding an outdoor ice skating rink for crisp winter nights. Just be sure to check the schedule before you go, as activities and hours vary by date. An event that dates back to 1954, when one sailboat from the Portland Yacht Club paraded along the local rivers decorated with ribbons and bows, the Christmas Ships Parade has grown over to include an average of 55 to 60 illuminated boats on the Columbia and Willamette Rivers. 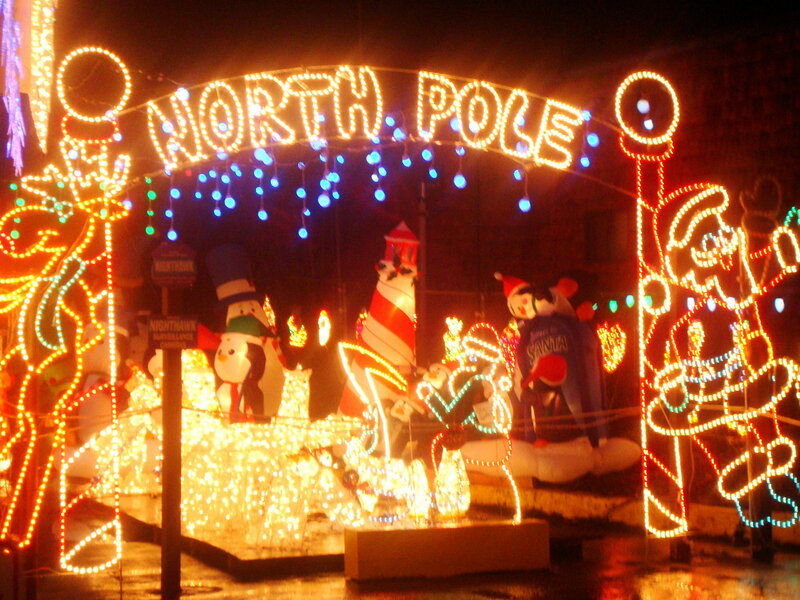 Hoping to stake out a viewing spot for this nautical light display? Simply check the schedule (here for the Columbia River and here for the Willamette River) and follow @ChristmasShips on Twitter to track the parades’ progress. This peaceful seven-acre park in West Linn is a favorite in all seasons for its wooded trails, access to the Willamette River, picnic areas, and variety of wildlife. But winter transforms Maddax Woods into a beautiful display of holiday lights, where children can participate in a scavenger hunt for dozens of illuminated woodland creatures. When: Nov. 14-Dec. 31, 4-9 p.m. Built by David Cole in 1885, the Victorian Belle is a historic home and landmark just six miles north of downtown Portland. For much of the month of December, this 2.5-acre estate is decorated with more than one million lights, 10 Christmas trees and countless Victorian antiques and heirlooms. Visitors will be treated to performances by local musicians and choirs, homemade apple cider, and other holiday-themed refreshments. Where: Victorian Belle, 1441 N McClellan St.
It’s no wonder that each and every holiday season, Portland families flock to SE Peacock Lane. Ever since the 1920s, the residents of this (usually) quiet street have been decorating their Tudor homes for the holiday season. Today, the tradition that has grown to include magnificent light displays, nativity scenes, Christmas trees, and replicas of beloved holiday characters. Although cars are technically allowed on the street for most of the holiday season, the high-volume crowds are a good reason to use public transportation, to park elsewhere, or to visit on one of the pedestrian-only nights. We want to know what’s your favorite holiday display! Tell us in the comments below!